Gemini have vast experience in producing Personal Dosimeter handling systems and accessories for the use in Radiation Dosimetry and Health Physics. Unwrapping, Wrapping, Cutting, Loading, Receiving, Unloading. Each process can benefit from a purpose designed instrument to automate time consuming tasks. 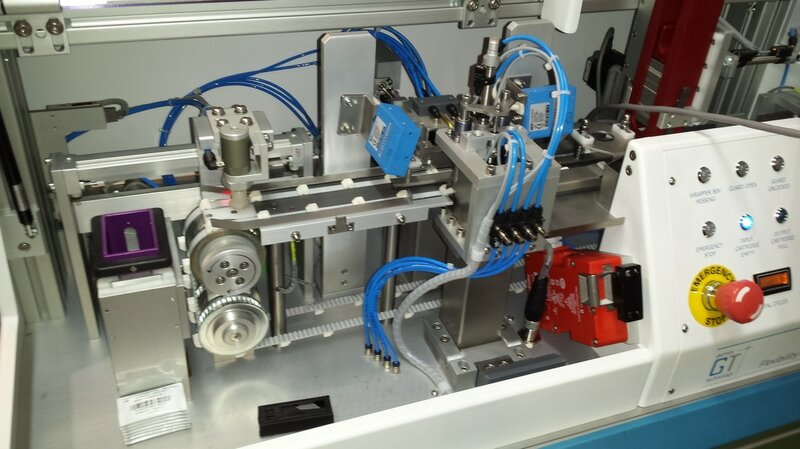 The latest incarnation of the Gemini Unwrapping machine features improvements in all area of the machine. Gemini were looking to improve reliability, maintenance access, reduce errors, and where possible increase capacity. The function of the TLD Unwrapper Machine is to remove TLD cards from there respective wrappers and carry them into an output cartridge to then be moved on to other areas. If the machine fails to cut or detects a bad bar code, the machine will then carry the card into a reject bin for inspection. The TLD machine is capable of unwrapping 600 cards per hour, or 2400 per day. The unit has an estimated working life in excess of 20 years. The Unwrapper machine is a multi stage mechanical function unit, housed within an aluminum frame console with Al Alloy & Perspex panels. The machine will not function unless the safety switch is made on the access guard and the cartridges are in position. The Safety Integrity Level for the TLD unwrapping machine has been set at the higher level of SIL 3. The TLD unwrapping system is designed to automatically open and remove Thermo-luminescent Dosimetry cards from their protective plastic packet, so they can be radiologically interrogated. The unwrapped cards are manually loaded into two input cartridges each containing 140 unwrapped cards. The cartridges are in the form of a rectangular tube approx 50mm x 40mm which stands about 600mm high. In operation the stack of cards are lifted up through the cartridge by a vertical motor driven elevator. Each card is then in turn lifted from the top of the stack up a vacuum sucker and transported into the cutting head. The unwrapped card is firmly clamped and one end of its wrapper is cut off. This is done with a power circular blade driven across on end of the packet. The card is removed from the wrapper by an extrusion process which involves pulling the wrapper through a narrow rectangular aperture. The now unwrapped card is lifted out of the cutting head with another sucker and placed onto a shuttle arrangement. This shuttle arrangement positions the card under an output cartridge. A vertical positioned ram pushes the card up into the output cartridge and the card is retained there by a latch arrangement. 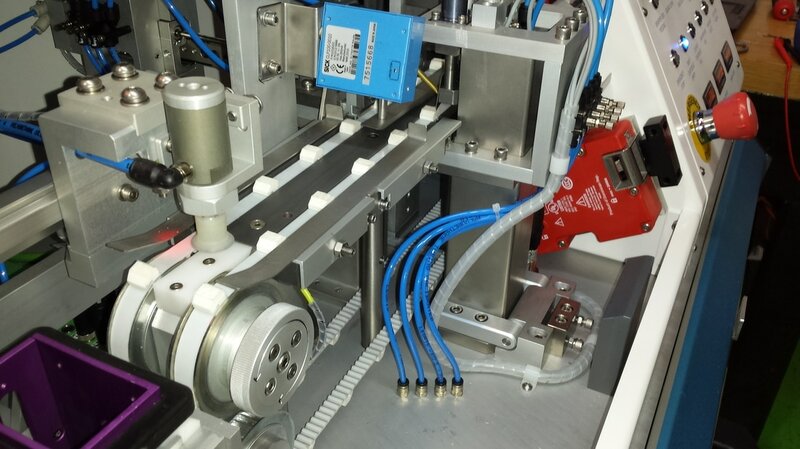 Once the cartridge is full of cards the Unwrapping machine automatically stops and the cartridge can be removed and replaced by an empty output cartridge. The function of the TLD Reception Machine is to log wrapped dosemeters back into the system via the output cartridge. During this process the machine will also check for Radioactive contamination and bad barcode’s. If there is either a bad code or bad dose detected then those particular packets are ejected into the relevant reject bins. The Reception machine is a multi stage mechanical function unit, housed within an aluminium frame console with Al Alloy & smoked perspex panels. The machine will not function unless the safety switch is made on the access guard and the cartridges are in position. The function of the TLD Unwrapper Machine is remove TLD cards from there respective wrapper and carry them into an output cartridge to then to moved on to other areas. If the machine fails to cut or detects a bad barcode, the machine will then carry the card into a reject bin for inspection. The Unwrapper machine is a multi stage mechanical function unit, housed within an aluminium frame console with Al Alloy & Perspex panels. The machine will not function unless the safety switch is made on the access guard and the cartridges are in position. Click ﻿here﻿ to see an unwrapping machine in action. The function of the Sorter is to move cards from an input cartridge to one of nine output cartridges under the control of an external computer. A quartz fiber dosimeter, sometimes called a self indicating pocket dosimeter (SIPD) or self reading pocket dosimeter (SRPD), is a type of radiation dosimeter, a pen-like device that measures the cumulative dose of ionizing radiation received by the device. Not widely used any more. 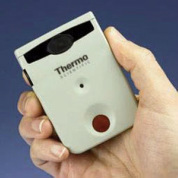 A Thermo EPD. It can be used both for environmental monitoring and for staff personnel in facilities involving radiation exposure, among other applications.